Boston continues to enjoy its status as one of the top spots for technology work in the country. The area’s Route 128 corridor is even considered by some to be the “Silicon Valley of the East.” A strong tech education community, led by MIT and Harvard, serves as an incubator for startups in IT and other business sectors. Additionally, Boston is headquarters to many leading companies in the healthcare and financial sectors. When considering the digital transformation currently happening in both, technical jobs are plentiful in 2019 and beyond. Let’s look more closely at why Boston remains the place to be for your IT career. A recent analysis from the personal finance website, WalletHub, ranked Boston second on a list of the best places to find a job in the STEM disciplines. Some of the criteria used in the study included the number of job openings and the annual median wage growth for these positions. Two other area cities – Worcester and Springfield – also made the top 20 on WalletHub’s list and all three tied for first for the highest math performance. Apparently, Massachusetts is home to many great mathematicians! WalletHub also considered the quality of technology educational institutions, R&D spending, and the number of patents earned in the city. Even high school math scores and the number of local tech meetups were part of their calculus. In short, living in the area is a boon those working in science and technology. For a tangible illustration of the robust Boston tech economy, look at the impact artificial intelligence is currently making in the city’s finance and healthcare sectors. Machine learning algorithms now power everything from securities trading to helping a doctor analyze an MRI. Companies working on these technical innovations regularly need an influx of talented technology professionals to bring these ideas to reality. Still, the Boston tech economy goes beyond banking and medicine. For example, Carbon Black, specializing in cybersecurity, and Fuze, a software company known for its unified communications system, ranked first and second on Built In Boston’s Best Places to Work 2019 list. 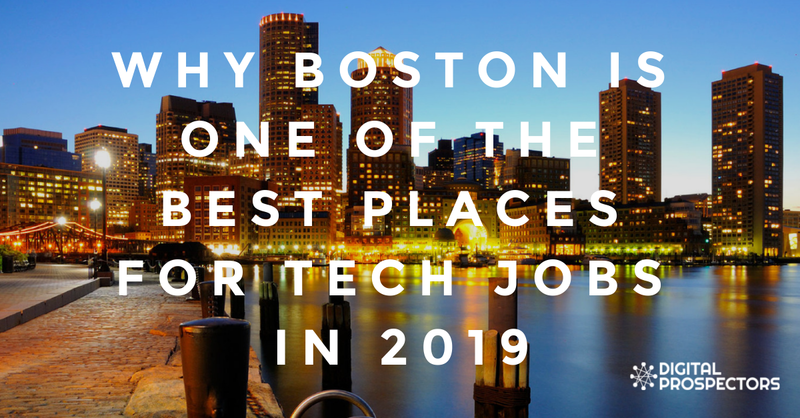 Ultimately, if you are looking to take your tech career to a higher level, Boston is the place you need to be! If you need help with your technology job search, speak with the experienced recruiters at Digital Prospectors. As one of the top IT staffing agencies in New England, we know the companies looking for talented professionals. Connect with us soon!